One of Ocean City's best vacation spots! Makai 206 is a lovely 2-BR, 2-BA, Bayfront condo that is conveniently located just a block from the Convention Center (42nd St.) and a block from the beach. Guests have all the comforts of home and many upscale features to make their stay easy and relaxing including 3 flat-screen TVs (in living room and both bedrooms), updated decor and furnishings, and fully-equipped Kitchen with granite countertops and stainless steel appliances. Step outside onto your private furnished balcony with beautiful views of the bay. Additional luxuries include Washer/Dryer & Wireless Internet access. Walk to the beach for a day of sun & surf, or stay home to enjoy the beautiful Indoor Pool Solarium. Makai amenities also include a Fitness Center, Game Room & Bayfront Deck where you can watch waterfowl & boats go by. Makai is within walking distance of many popular restaurants, shops, and activities, including Seacrets (6 blocks), Doughroller, Rita's Italian Ice, and Endless Summer Surf Shop. The Roland E. Powell Convention Center located next door hosts hundreds of events and conventions throughout the year, such as car shows (Cruisin' Ocean City and Endless Summer Cruisin'), OC Bikefest, and OC Boat Show, as well as music and dance performances. Ocean City's vibrant downtown area and popular Boardwak located in the south end of town are also just a short drive or bus ride away. This property is only available for Saturday check-in during the season and FlexStay (check-in any day of the week - 3 or 4 night minimum) during the off-season. If you purchase a linen Package from one of our vendors, the linens will be delivered to the property on your arrival date. Linens are not installed on the beds. On Departure remove ALL bed linens (Sheets and Pillow cases ONLY), Bath Towels, Washcloths, and Kitchen Towels and place them in the bags provided by the Linen Company and place them near the front door. For the price, I expected better. There was a bay view, (past the parking lot and factory). Large black marks on the walls in the hallway and into the living room. Stain on the living room sofa. Dirty dishes in the cabinets from the guest before. For the price, I expected better. Shower water pressure in master bedroom non existent - called for maintenance - no one came or called even though it was promised twice!! the place is very nice but your rental company does little to maintain your property!!!! MAKAI (42nd St.) is a beautiful, BAYFRONT property with luxurious accommodations & amenities. 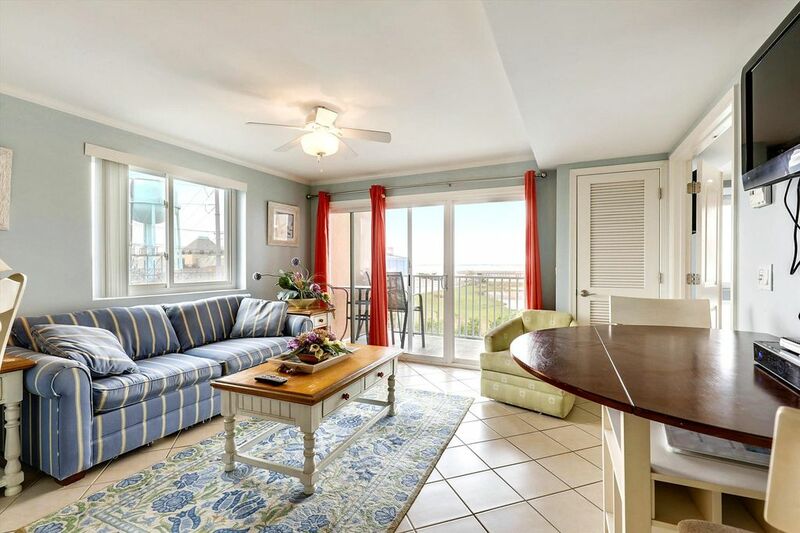 Located just 1.5 BLOCKS from the Ocean, this property offers you the best of both worlds: a quiet, Mid-Town setting with all of Ocean City's fun & excitement right at your fingertips. Many great shops, activities & restaurants are within walking distance, including South Moon Under, SEACRETS (6 blocks), Doughroller, Endless Summer Surf Shop & OC Convention Center. Best of all, you’ll be just minutes from the popular OCMD BOARDWALK, thrilling amusement rides & world-class golf.